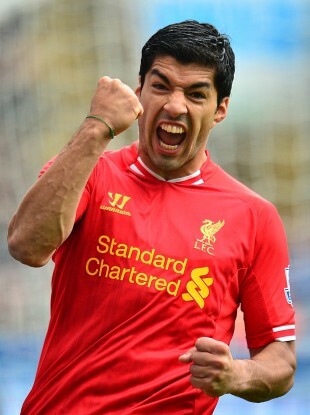 Liverpool's Luis Suarez - one of the Premier League's most dangerous strikers. I DON’T KNOW about you, but this canine admires Luis Suarez’s at times animalistic tendencies in front of goal. Hence, I’ve added him to my team in place of Robin ‘Injured’ van Persie despite the stellar 16 points he provided me with last week. Aside from that, I’ve kept things simple. Roberto Soldado finally seems to be getting his act together, scoring a non-penalty goal for the first time ever in the Premier League last week, hence our misguided loyalty to the Spanish striker does appear quite so misguided all of a sudden. I’ve also stuck with Peter Whittingham in midfield because he’s a good pro, he’s got a great work rate and… did I mention he’s a good pro? Elsewhere, Aaron Ramsey and Olivier Giroud continue to show how wrong everybody was about them last year. Don’t worry guys, Godfrey always had faith in you. Better still, David Silva is looking like the old David Silva, having this season initially looked like the new David Silva, while his teammate Samir Nasri suddenly looks like the new Samir Nasri, having looked like the old Samir Nasri for a while there. In other words, Nasri is rubbish now. Silva isn’t. Hence, we’ve opted to pick the latter. We still have two really solid defenders and Ciaran Clark (and Paul McShane on the bench). Clark has been doing his best Richard Dunne impressions all season, managing to look consistently imperious, while never quite shaking off the suspicion that he might concede a hat-trick of own goals and get sent off at any minute. I also, quite possibly in a fit of drunkenness, placed faith in Norwich’s Steven Whitaker, but the less said about that the better. But even if our backline may be susceptible to the odd error, I’ve still got everyone’s favourite Belgian goalkeeper, Simon Mignolet, between the sticks. Mignolet let us down last week, only gaining one point from Liverpool’s 2-2 draw with Newcastle, but we’re more than confident he’ll do the business against the might of West Brom this weekend. Sure, they never do anything against the big sides *coughs nervously*. If you have any suggested player slags or general advice for next week’s Fantasy team, please let us know! Email “Diary of a Fantasy Gaffer: When bite was needed in attack, there was only one player to turn to...”. Feedback on “Diary of a Fantasy Gaffer: When bite was needed in attack, there was only one player to turn to...”.